Yesterday I was reading Brian Clark’s article 10 Sure-Fire Headline Formulas That Work for the umpteenth time, and got inspired to do a similar article for Facebook. Brian’s article makes it easy by providing fill-in-the blank formulas for writing great titles for articles. I decided to create a similar list that makes for easy fill-in-the-blank status updates for Facebook Pages - not only for a catchy blog post, but to make my own life easier. I define “engagement” as a share, like or comment, not a click (which I will save for a later post). In this article I will focus on showing formulas for making posts that don’t contain links, but have all of the content housed within the post - including images, video and text. These posts need to include quick 1 - 2 sentence pieces of information to solve common problems. It’s better for them to be lesser-known, but even if people already know about the solution, they will still interact with comments such as “My mom showed me that!” or “I do this all the time, it works great!”. This type of post has a double impact: It provides engaging content for fans and creates an image for your business as a knowledge information source. This will create trust for your brand and bring people to you to not only answer their questions, but also provide solutions that they trust in the form of your products or services. This is fun and simple post that is 90% visual and 10% text. The only text that is needed it “Caption this!”. These work best with photos, but are also great to do with Vines or short-format videos. Visuals can be funny pictures of animals or toddlers, or awe-inspiring photos of landscapes or human moments. The brand image you want to create will dictate the types of visuals you use. When choosing a visual, always think about the emotion you want to trigger within a person, happiness, hope, surprise, etc. Choose visuals that will hit people with a lightning bolt when they see your photo, and trigger them to engage with it. A great place to find photos for this is the Reddit “sub-reddit” /r/pics. The photos at the top with the most votes already have proven their power to engage people, so they’re usually a good choice. This type of post gets people thinking about upcoming events and times. And, if executed right, is awesome for getting people talking about using your products. Use an activity or time that is suited to your products, like cold winter nights, a family ski trip or a night out with friends. 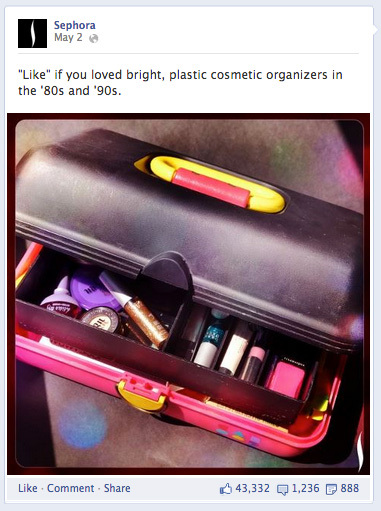 This will push people to suggest the types of products they like to use that you sell. 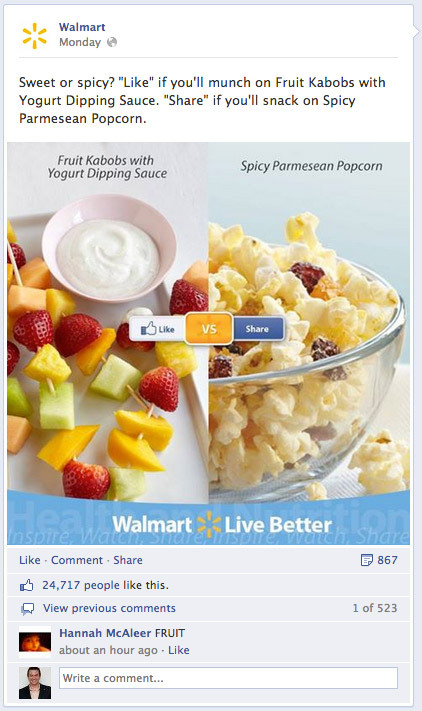 A “Like” vs. “Share” post is an easy way for people to voice their opinion by engaging with your brand. In a nutshell, this post consists of two competing options. A person can “Like” the post to vote for option A or “Share” the post for option B. 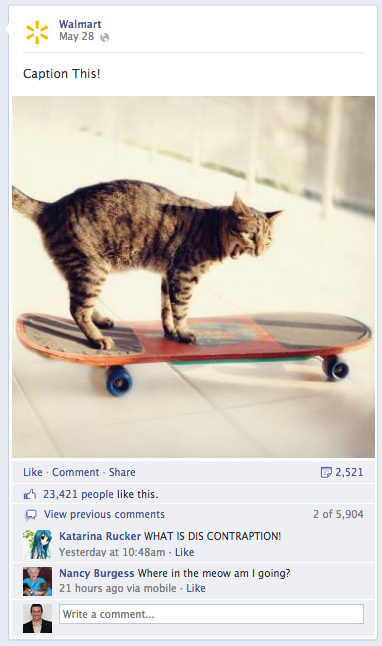 The “Like” and “Share” counters on the post act a a built-in vote count to see which side is winning. It also acts as social proof of the number of people participating and pushes others to join in as well. To execute this post, create an image, like the one below, that includes a side-by-side mashup of two images (with a descriptive title for each image) and a small graphic overlay that reads “Like vs. Share”. Then add a short description that reinforces how to participate and you’re done! Which is your favorite type of date movie? “Like” for comedy. “Share” for romance. What is your perfect Friday night? “Like” for a quiet night at home. “Share” for a wild night of partying. “Like” for iPhone. “Share” for Android. This type of post encourages people to think about how they would act or what they would do in certain situations. It’s a fun way for people to use their imagination and engage with your posts in a purely friendly way. Get people thinking about a fun or life-changing situation to get them talking about what they would do if something extraordinary happened. Or use an awkward or funny situation to get people to say how they would react. “Like” if you love blueberries in the summertime! “Like” if you are excited for our new Fall fashion line-up! “Like” if you’re going to an epic Superbowl party this year! 8. Remember when [old fad/tradition]? Nostalgia is a great way to engage people. Even if the thing you’re remembering was not the best at the time, like the Lowe’s example below, it’s fun a reminice and think about what it was like back in the day. It will give people an opening to comment about their memories from that time period or how thankful they are now that a certain fashion has gone out of style. Remember when the kids in Saved by the Bell seemed old? Remember when you had to actually remember your friend’s phone numbers? Remember when going to your friends house across the street felt like an adventure? I hope this list of formulas and examples will help you through your writer’s block and engage your fans more on a regular basis! I know that it’s helped dictate my upcoming content schedule already. Now it’s your turn to share. What types of posts give you the most engagement? Have you used any on this list? If you really want to drive engagement on your Facebook page, remember that Wishpond's Facebook Contest Apps make it easy to create sweepstakes, photo contests, hashtag contests & more.